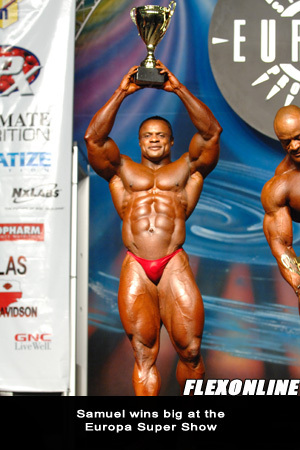 From seemingly out of nowhere, Silvio Samuel burst onto the bodybuilding radar in 2007, using the first contest of the year, the Ironman Pro, as his launching pad. From there, Samuel was bodybuilding's version of the Energizer Bunny -- he just kept going and going. By the time the 2007 competitive season had ended, Samuel had competed in eight contests, placing in the top five in all but two -- highlighted by his win at the Europa Super Show and a seventh-place finish at the Olympia -- and proved he deserves to be mentioned among the sport's best. Heading into the Ironman Pro on February 16, El Matador sat down with Flexonline and let us know he's not satisfied to stop there. FLEXONLINE: Your success in 2007 took a lot of people by surprise. Did it take you by surprise? SILVIO SAMUEL: 2007 was really a fantastic year for me and it was really how I expected it. I learned a lot in each of the shows. Winning my first show really put me in a good position for my first appearance in the Olympia. All of those shows boosted my morale and inspired me high no matter what the level of competition. FLEX: You placed 7th at the 2007 Olympia. When did you realize cracking the top 10 was a possibility for you? SS: At the beginning of the year, I just wanted to qualify. My plan was to take every show at it's own level. Somewhere along the line around the middle of the year, then I could really tell how I was going to place in the show. Going into the Europa, I wanted to win. I was looking for a win because I knew that would really place myself in with the top guys [at the Olympia]. The Europa Super Show really gave me the real energy and force to go in and reckon with the big guys at the Olympia. I wasn't really saying I was going to be there in the Olympia until after the Europa. Then I started thinking I could crack the top six. WERE YOU SATISFIED WITH PLACING 7th AT THE OLYMPIA? SS: Top seven for me was like winning the biggest show ever, and that really builds up my plans for this year for 2008. AN YOU IMPROVE ON WHAT YOU DID IN 2007? SS: My plan for 2008 is trying to put the mark, not leveling off what I did in 2007 but going beyond. Because a lot needs to be done and my body, still there is room for improvement and there is much which I need to do in regards to more improvement. After this being my 2nd year going in the game, I believe I still have more to show. That is why, it's gonna be more - I really promise everybody - they're gonna see even more than what they saw in 2007. WHAT IMPROVENTS HAVE YOU MADE? SS: Actually I had three parts of the body I had to improve. Which were the size and thickness in the back, as well and increase the calf level and then mostly work on the separation of the upper part of the legs. So I worked on that and really at the moment it is paying off so well. That is going to be a good factor for the year. FLEX: DO YOU HAVE ANY PREDCITIONS HEADING INTO THE IRONMAN PRO? SS: My inspiration for this game really is higher than what it was in the beginning of last year when I came in for the Ironman show. Last year I wanted to come in and make an impact. I knew the names, like Toney Freeman, Mark Dugdale and Eddie Abbew. I said I would be within that very range, that's what I was thinking. I thought of being within the second place there, but was impressed breaking into fourth place which really helped me a lot moving into the next shows. In 2008 my expectation is higher because now I'm really settling down here. I got to compete with most of these guys on stage [last year] and really sit down and study every bit of them. The confidence I have correcting all my mistakes and quality I have I believe I can bring out the best I can in this Ironman. With all the improvement I have made, I am not stepping out there just to be there. I'm stepping out there to be at the Number One spot. FLEX: SO YOU'RE PREDICTING A WIN AT THE IRONMAN? I think first or second spot is what I'm looking for. I'll leave it to the judges to decide that. FLEX: LET'S TALK ABOUT A FEW OF THE COMPETITORS YOU'LL BE UP AGAINST AT THE IRONMAN. FIRST OF ALL, DID YOU READ GUTAVO BADELL'S INTERVIEW ON FLEXONLINE? SS: I read it. He said my body is kind of a fitness body (Laughs). FLEX: DO YOU WANT TO RESPOND TO THAT? SS: Not really. You know all these guys are guys I respect a lot because I started my career in bodybuilding just a few years ago and they were guys I looked up to. So if I have to be in this level competing with them I still give respect to every one of them. My motivation or my kind of rules in this game is not giving replies to what anybody says. Everybody has every right to say whatever they want to say. The point is that where a true bodybuilder speaks is on the stage. FLEX: SO HIS COMMENTS DIDN'T BOTHER YOU? you saw where he was. So really, I'm not a bodybuilder that goes on replying to whoever is saying anything. When we get on stage it's for competition, not for trash talk. FLEX: DO COMMENTS LIKE GUSTAVO'S MOTIVATE YOU AT ALL? SS: I have been already motivated before getting into the show, so whatever anybody might be saying doesn't really count in terms of disturbing me. That's why I don't want to say any of that is important. What is important is who is better than who, just like what happened at the Olympia. Most of these guys, they do what they do and then they give an excuse later. I believe with his talk, it was the same like what happened in the Olympia press conference. He came and he says he had every package, he showed everybody what he had. I don't know what mistake he said happened overnight for him to be at where he came in. So that is why most of this talk we don't really need it. I don't really need to pay attention to it. His talk will not motivate me and neither will it disturb me because the show has been already motivating me. FLEX: DO YOU HAVE A PREDICTION FOR THE TOP FIVE AT THE IRONMAN? SS: That's always difficult to say. But I would say Phil Heath will be there because his potential, this guy really has to be reckoned with as one of the top guys. It is going to be between Phil and Toney Freeman and somebody like David Henry. Gustavo also will be there and we are going to be rocking out there. Johnnie Jackson has good thing for sure as well. It is a really a tough lineup. It's going to be who brings the best.